The kit drummer is the very minimum a brass band can get away with. There are possible times when he might not be needed, like accompanying hymns etc, but even here he would be sorely missed. 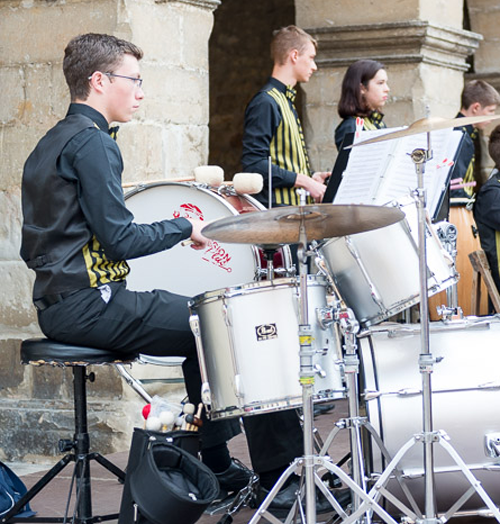 A good kit drummer can make or break a band, and he is often singled out for criticism or praise by an adjudicator at a contest. The kit drummer is the one sitting on a stool, surrounded by tomtoms, snare drums, cymbals, and is usually parked away at the back of the band! 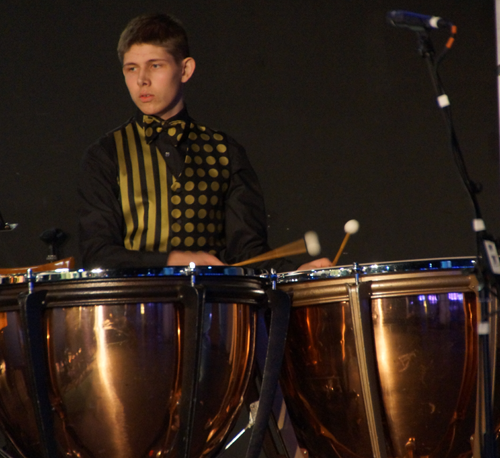 These are very large freestanding drums (often called "kettle drums") that are very important in much brass band music. they can thunder out a pattern to lay a foundation for a march perhaps, or can be used very delicately to give an air of mystery to a piece. They are very versatile, but like the Bb bass are very big! These devices are rarely owned by an individual player as they are very expensive, and few people have a house big enough to keep them in, let alone have the transport to get them to band practice! This covers a variety of instruments like glockenspiel, xylophone, marimba, tubular bells and anything else that has a series of metal or wooden blocks cut in such a way as to produce the notes of a scale. 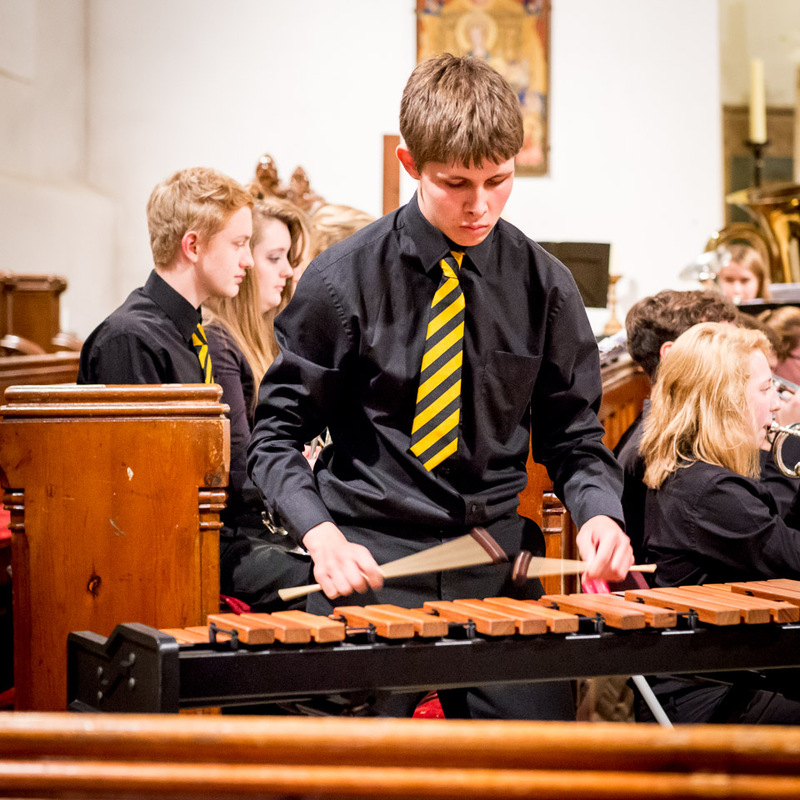 The glockenspiel is the instrument of choice of a brass band, and can be heard in many pieces. These are the people who build sheds at the back of the band! There seems to be a never-ending variety of other miscellaneous percussion devices, like triangles, tambourines, wood blocks, cowbells, castanets, extra drums & cymbals. 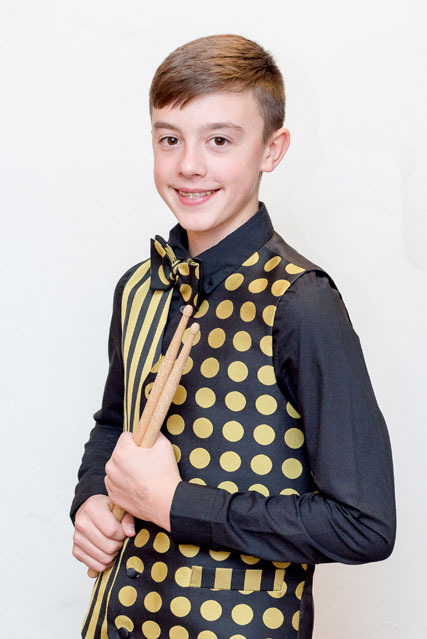 If it is possible for one of the other percussionists to play them at the appropriate time in a piece then great, but often it isn't easy to transfer from one to another quickly enough, even if the player is a very fast runner! If the piece being played is very "busy" in terms of percussion, then additional players will be needed.